Leaders in the marketing arena will provide synergistic strategies and tactics using multiple marketing channels, at eMarketing conference April 25th and 26th in San Francisco. Keynotes by the President of MSNBC and the Vice President of Brand Marketing for Yahoo!, will kick off the event. Conference registration now open to marketing and business professionals. The eMarketing Association today announced that it's eMarketing Conference will cover all media for online marketing. Included will be sessions on blogs, podcasting, word-of-mouth, banner advertising, email marketing, integration of offline media, rich media, mobile marketing, e-commerce, website and search marketing. Robert Fleming, CEO of the eMarketing Association said, "the sheer number of marketing channels available make the process of designing and implementing successful programs a challenge. The unprecedented number of tools and technologies that marketers need to understand and utilize will be covered in detail at this event in San Francisco. We have enlisted leading executives in each arena to provide attendees with best practices, processes and techniques that they can use immediately to improve their marketing ROI. The event atmosphere is sophisticated and professional, providing excellent opportunities for networking and exchange of ideas and innovative strategy. No other conference provides this type of focus on actionable techniques covering all media within the Internet marketing arena". Mr. Fleming added, "There are no confusing break-out sessions, exhibits or tracks. We have designed this to be a comprehensive and complete agenda that covers all aspects of Internet marketing clearly for senior level marketers. Professionals that have an interest in achieving maximum effectiveness for their on and offline programs should attend. Membership in the eMA is not a requirement for registration. I suggest that interested marketers register now, since this event has sold out in the past." Speakers include senior executives from Yahoo!, MSNBC.com, Wal-Mart, Ford, Tribal Fusion, Internet Advertising Bureau, The Mobile Marketing Association, Intellisync, Silverpop, did-it.com, Microsoft and others. A welcoming reception hosted by Yahoo! will follow on day one. 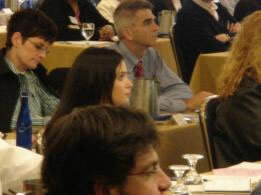 Thousands of marketing professionals have attended eMA events. Attendee testimonials indicate that a large percentage of attendees are able to immediately implement strategies to enhance their marketing ROI. eM5 will be held at the Crowne Plaza Hotel in Union Square San Francisco on April 25th and 26, and is open to marketing and business professionals. The event is sponsored by: Yahoo!, MSNBC, Digital Impact, Blue Lithium, The Mobile Marketing Association, The Interactive Advertising Bureau, Silverpop, Tribal Fusion and Microsoft. Additional sponsorships are still available at eMarketingAssociation.com. The eMarketing Association (eMA) is the worlds largest international association of eMarketing professionals. Members include governments, companies, professionals and students involved with the eMarketing arena. The eMA provides marketing resources, services, research, certifications, educational programs and events to its members and the marketing community. The eMA works with a number of organizations, companies and governments on issues related to e-Commerce, multi-channel marketing and legislative issues. The eMA has members in over 40 countries around the world, and sponsors or manages over 30 events a year. More than 3,000 marketers have enrolled in eMA online courses and thousands of eMarketing professionals and students have achieved certification status. The eMA is committed to enriching the marketing community and its members through recognition, research, advocacy, education and service. Information on this event and others is at the eMA website. eMarketingAssociation.com.